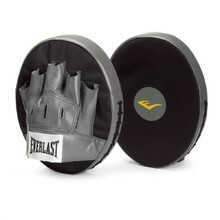 Punching pads and mitts are essential for any speed or reaction training with a sparring partner. These are foam/textile “blocks”, usually round in shape, the trainer uses during the exercise. The boxer tries to hit the pads the best they can, per their trainer’s instructions. You can choose from various sizes and materials. You can use the pads either on your hands or feet.